The earliest settlers of Babylonia were the Sumerians, a people whose origin is unknown. PRE FLOOD GROUP. When the Sumerians first settled by the banks of the Euphrates River, it must have been on the sandy plateau to the west of the river where the city of Ur, (the modern Mugheir) was later built. The Flood ended in 2369. The colonization started 131 years after the flood. One hundred thirty-one years later brings us to the date of 2238 B.C. In 2261 Noah took his sons on a world tour. The tour, according to the account of Lemaire, took eight decades and required ten years to complete. The tower of Babel began 2256. Eighteen years after the Babel tower project begun, God stopped the construction. God caused the great majority of people to end up in the areas of the world where He had originally intended them to settle. Cush was the earliest king of Babylon. He began his reign in the city of Kish. Kish is situated at a point where the two great rivers are closest together. Kish is named in the earliest Babylonian lists as the first city to furnish a dynasty of kings. He was also the first King of Babylon. Nimrod was driven from Mesopotamia to Egypt by Asshur. Asshur descendants dominated the area of Mesopotamia. Asshur means “strong” or “powerful”. Asshur was a brother of Arphaxad (Gen.10:422). The Assyrians—who came from Asshur—settled along the Tigris River around the city of Nineveh (Gen.10:11). Nimrod joined his father in reigning over Egypt for 2 years from 2194-2192. Then Nimrod and Semiarmis killed Cush. He lived only 170 years. Leaving Egypt to Nimrod who reign from 2192 –2167 twenty-five years. He was called Athothis or Osirus. In 2167, he were driven from Egypt by Shem. He fled to Italy where he were killed by Shem. Semeramis also fled to Assyria and stayed for 30 years. During that time the Egyptians were without a king. She returned to Egypt with her young son Horus. In history Horus was known as Gilgamesh. Semeramis told the people that she were impregnated by the spirit of Nimrod and Nimrod lived on through Horus. Semeramis ruled for 4 years until Horus was old enough to reign solelyl He reigned from 2125 for 31 years. In 2094 Horus led a group of people into Western Europe to settle. He left his mother to reign over Egypt for 11 years. He then returns to Shinar to rule for another 131 years until 1968 up to the time of Abraham. When Horus returned to Assyria, he found himself in a war with his mother and Ara the king of Armenia. Gathos, Ara’s successor, the king of Armenia, gave her an army. Both Gathos and Semeramis were killed in the battle against Horus. Shem came to Egypt to rule as the 7th King of Egypt called Thinis. He was called the old man with the beard. He divided Egypt into 2 parts. When Noah became ill, Shem left Egypt and took over the responsibilities of Noah in Italy. 1978 Asshur assumes reign over Western Europe. About 2800 B.C., there arose in Akkad (Agade) a Semitic chieftain named Shargani-shar-ali and is best known to us as Sargon I. The text, known as the “Tablet of Omens” is found translated in “Revue d’ Assyriologie, iv, No, III” and contains records of Sargon’s expedition and subjection of Elam. Sargon was the first great leader in the history of the Semitic Race and the founder of the first great nation in Western Asia. Sargon I of Akkad reigned from 2334-2279 B.C. which means he also lived during the period of the building of the Tower of Babel. The tower of Babel began 2256. The ancient historian, Julius Africanus, preserved the fact that Nimrod began his sole reign in 2192 following a joint reign with his father, Cush. Sargon is undoubtedly Nimrod of the Bible. Nimrod’s kingdom included the cities of Babel, Erech, Accad, and Calah, all in Shinar. 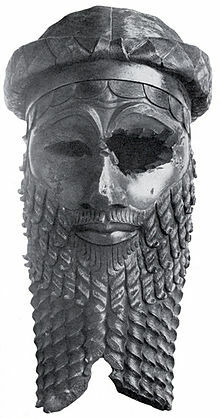 Sargon is called “Sharghani”. The name “Ghan” is also translated into other languages as “Khan” and Khan means “Cain”. The word “sar” is an interesting word. In Hebrew, it means “ruler”. In Akkadian, it means “king”.! Historical Proof of Nimrod existence: References from Historians. “The figures of King Ninus and Queen Semiramis first appear in the history of Persia written by Ctesias of Cnidus (c. 400 BC), who claimed, as court physician to Artaxerxes II, to have access to the royal historical records. 2) Ctesias’ account was later expanded on by Diodorus Siculus. Ninus continued to be mentioned by European historians …[up to] the 19th century.He was said to have been the son of Belus or Bel, a name that may represent a Semitic title such as Ba’al “lord”. 4) James Legge “The “Bamboo Annals” c, volume III, part one, page 115, describe China’s first king — as having eyes that shone with “double brightness!” Shun was not a Chinaman but a barbarian or Ethopian. 5) The Shabaka Stone also gives the account of Horus and his death. 6) The names of the first four rulers of Dynasty I are occurring to Manetho : Menes, Athothis, Kenkenes. Uenephes. Athothis, Egypt’s second king, was Osiris. The tomb of Athothis at Abydos in Egypt was worshipped as a god. “the sepulchre of the god Osiris, and, as such, became the shrine to which millions of pilgrims made their way,” (Arthur Weigall in “A History of the Pharaohs”, vol. I, page 111.) See Picture below of Abydos, Egypt. 2000 BC the ancient Sumerian city of Assur came under Assyrian control by about 2000 BC, serving as the capital of the Assyrian Kingdom. Amorites (a Semitic tribe) gain control over Southern Mesopotamia, ending independent Sumerian rule in the region. They were the descendants of Aram the son of Shem. The Amorites founded a Babylonian dynasty under Sumj-abi (Shem is my father) a name which we cannot fail to recognize as the Shem of the Old Testament. Gen_10:22 The children of Shem; Elam, and Asshur, and Arphaxad (R PA SHED), and Lud, and Aram. Elam Conquered by Hammurabi/Amorites (1702 BC): The Iranian kingdom of Elam invaded Babylon in an attempt to expand its kingdom. It was during this period in time that Abram (the son of Terah) was born but not in Ur. He was of Semitic ancestry and a descendant of Heber (the Hebrew). Abram was, also, a great great grandson of Shem. At this point in history, Abraham moved into Canaan. He was from a royal line. The Bible calls him a Prince. Gen 23:6 Hear us, my lord: thou art a mighty prince among us: in the choice of our sepulchres bury thy dead; none of us shall withhold from thee his sepulchre, but that thou mayest bury thy dead. After the death of Hammurabi, the Babylonian empire began to disintegrate. Mitanni Establish Capital in Mesopotamia (1600 – 1531 BC): Mitanni establish an independent city-state in the Northern Mesopotamian river basin during the Babylonian Dynasty, controlling trade point. Who were the Mitanni ? Abraham had a concubine, Keturah, who was his wife after Sarah died. She bore him a number of children whose wanderings are often lost sight of. They are enumerated in Genesis 25:1-6. Abraham sent them northeast toward Mesopotamia. Gen 25:1 Then again Abraham took a wife, and her name was Keturah. Gen 25:2 And she bare him Zimran, and Jokshan, and Medan, and Midian, and Ishbak, and Shuah. Gen 25:6 But unto the sons of the concubines, which Abraham had, Abraham gave gifts, and sent them away from Isaac his son, while he yet lived, eastward, unto the east country. Ishmael and Midianites are together. They mixed and lived together. Gen 37:25 And they sat down to eat bread: and they lifted up their eyes and looked, and, behold, a company of Ishmeelites came from Gilead with their camels bearing spicery and balm and myrrh, going to carry it down to Egypt. Gen 37:26 And Judah said unto his brethren, What profit is it if we slay our brother, and conceal his blood? Gen 37:27 Come, and let us sell him to the Ishmeelites, and let not our hand be upon him; for he is our brother and our flesh. And his brethren were content. Gen 37:28 Then there passed by Midianites merchantmen; and they drew and lifted up Joseph out of the pit, and sold Joseph to the Ishmeelites for twenty pieces of silver: and they brought Joseph into Egypt. Gen 17:20 And as for Ishmael, I have heard thee: Behold, I have blessed him, and will make him fruitful, and will multiply him exceedingly; twelve princes shall he beget, and I will make him a great nation. Hittites from Anatolia invaded the Babylonian Empire, leading to its collapse. A group of invading people called “Kassites,”descended upon the Babylonian plain from the east. One of the major tribes of Elam were the Kassites, and they were “an Elamite tribe who played an important part in the history of Babylonia.” ( Encyclopedia Britannica under “Kassites”). Greater Poland is populated with the Elamites which formed Greater Elam of the ancient world. SLAVIC PEOPLE TODAY. (See The True Origins of the Eastern People of Europe found on this web page). They reigned over Babylon for 400 years. After the collapse of the Mitanni, due to battles with the Hittites from the north, and rebelling Assyrians, Assyria was once again independent after more than 400 years under foreign rule.